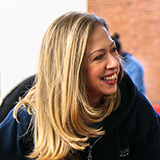 CHICAGO -- Chelsea Clinton will close out the 2016 Midwinter Meeting at a special session from 2 p.m. - 3 p.m. on Monday, Jan. 11. Attendees will want to be sure to stay to hear her speak about her new book “It’s Your World: Get Informed, Get Inspired & Get Going!” that addresses our biggest challenges, offers ideas for action and inspires readers of all ages to do their part to make the world a better place. “We have a saying in my family — it's always better to get caught trying (rather than not try at all). I hope we can all get caught trying,” says Chelsea Clinton in a letter to the reader on the website for “It’s Your World: Get Informed, Get Inspired & Get Going!” Be sure you don’t miss this special closing session where Clinton will speak about writing a book that addresses the biggest challenges facing us today, offers ideas for immediate action and inspires readers of all ages to do their part to make the world a better place. Combining facts, charts, photographs and stories to give readers a deep understanding of the world around them, the book covers issues such as poverty across the globe and in the U.S, access to education, gender equality, epidemics, non-communicable diseases, climate change and endangered species. The examples of how some children and teens have made real changes, big and small, in their families, their communities, in our country and across the world show how anyone can make a difference. One of Clinton’s favorite childhood books was “50 Simple Things Kids Can Do to Save the Earth” -- as an elementary school student in Little Rock, Arkansas, she helped start a paper-recycling program at her school; as a teenager in Washington, D.C., she led her school’s service club; and as a student at Stanford University, she volunteered as a reading and writing tutor and at the Children’s Hospital. Today, she is vice chair of the Bill, Hillary and Chelsea Clinton Foundation where her focus is especially on work related to health, women and girls, creating service opportunities and empowering the next generation of leaders. There’s more about the project, including resources useful to libraries, at www.penguin.com/itsyourworld. Clinton’s appearance at ALA Midwinter Meeting & Exhibits is sponsored by Penguin Young Readers. The conversation starts here . . . Registration and housing for ALA Midwinter Meeting open at noon (Central), Oct. 1, 2015 at alamidwinter.org. Bundle registration for 2016 Midwinter Meeting & Exhibits and ALA Annual Conference & Exhibition opens at noon (Central), September 9, 2015, through noon (Central), September 30.